Dr. Susana Raygada and Dr. Katrina Hernandez-Leveriza provide gentle dental care for the whole family. Along with their team members, the doctors deliver patient-centered treatment that improves oral health, one smile at a time. As a family-friendly office, we’ll treat you like a family member: with respect, compassion, and empathy. You’ll never be a number on a chart to any of us. We care about your dental needs; even more, we care about you as an individual. Our doctors and team thrive on building long-term friendships with our patients while helping them achieve their best smile. We look forward to becoming your friend, too. 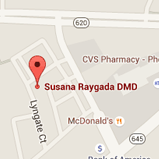 To learn more about the painless care we offer, and schedule a visit, please contact our Burke, VA dental office. Dr. Raygada, Dr. Hernandez-Leveriza, and our team can’t wait to welcome you to our dental family. It will be our honor to help you attain a healthy, beautiful smile you’ll confidently share. Call, today!